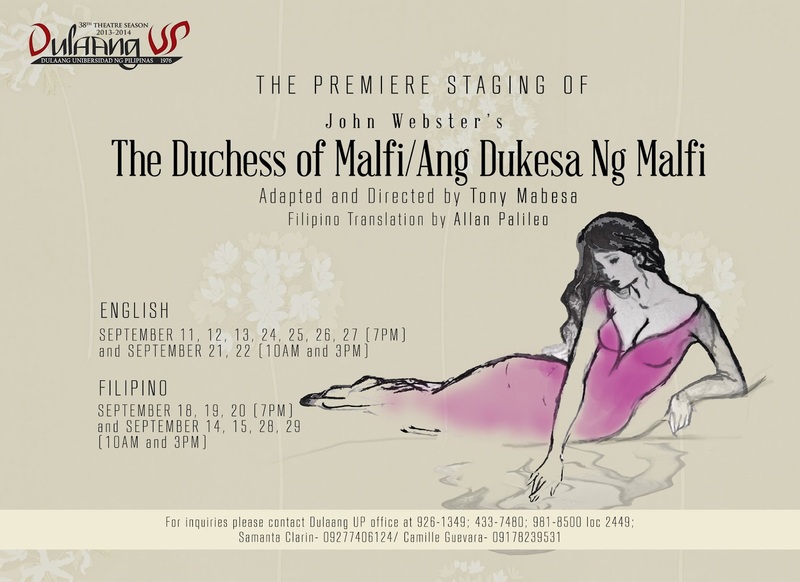 In case you didn’t know, Dulaang UP will stages John Webster’s The Duchess of Malfi on September 11-29, 2013 at Wilfrido Ma. Guerrero Theater, UP Diliman . This is one of Webster’s works and the most gripping of the Jacobean tragedies. DUP’s production also features Ang Dukesa ng Malfi as translated into Filipino by Palanca awardee Allan Palileo. The play is adapted and directed by theater icon and DUP Founding Artistic Director Tony Mabesa, well known for his staging of world and Filipino classics. New York-based Obie award winner Clint Ramos and Eric Pineda collaborate for the set and costume design respectively; Choreography by Peter Alcedo, Jr., Lights design by Meliton Roxas, Jr., and Sound design by Jethro Joaquin. September 11, 2013 (Wednesday) – 7:00 p.m.
September 12, 2013 (Thursday) – 7:00 p.m.
September 13, 2013 (Friday) – 7:00 p.m.
September 14, 2013 (Saturday) – 10:00 a.m. ; 3:00 p.m.
September 15, 2013 (Sunday) – 10:00 a.m. ; 3:00 p.m.
September 18, 2013 (Wednesday) – 7:00 p.m.
September 19, 2013 (Thursday) – 7:00 p.m.
September 20, 2013 (Friday) – 7:00 p.m.
September 21, 2013 (Saturday) – 10:00 a.m. ; 3:00 p.m.
September 22, 2013 (Sunday) – 10:00 a.m. ; 3:00 p.m.
September 24, 2013 (Tuesday) – 7:00 p.m.
September 25, 2013 (Wednesday) – 7:00 p.m.
September 26, 2013 (Thursday) – 7:00 p.m.
September 27, 2013 (Friday) – 7:00 p.m.
September 28, 2013 (Saturday) – 10:00 a.m. ; 3:00 p.m.
September 29, 2013 (Sunday) – 10:00 a.m. ; 3:00 p.m.
For more details, you may call 926-1349/981-8500 loc 2449, Fax: 433-7840. Regular ticket price: 350 pesos.